Our team sought to partner with Feed My Starving Children (FMSC), an organization that ships packets of life-saving food to malnourished and impoverished families and orphans all over the world. The best way for our team to support their cause was to provide the three things they always need: donations, volunteers, and awareness. To facilitate this, we partnered with Team 3 (who was also supporting FMSC) and planned a joint fundraising, volunteering, and social awareness campaign. We looked to deliver on all three fronts by hosting a major multi-faceted event on August 8th, which included a red carpet event with a photographer (to use for our post-event social media push), a fundraising food basket raffle, a two-hour packing event, and a fundraising dinner immediately following (with a contribution equal to 15% of the check). 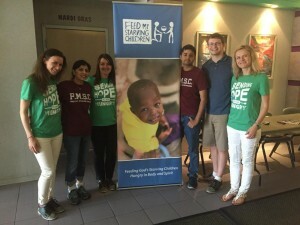 We also conducted an ongoing fundraising drive online with the support of FMSC during the length of the class, and supported both the fundraising and service efforts with a comprehensive social media campaign that included Facebook, Instagram, Twitter, and email/phone calls/face-to-face interactions. Founded in 1987, FMSC is a national non-profit organization, based in Minnesota with three locations in the Chicago-land area. 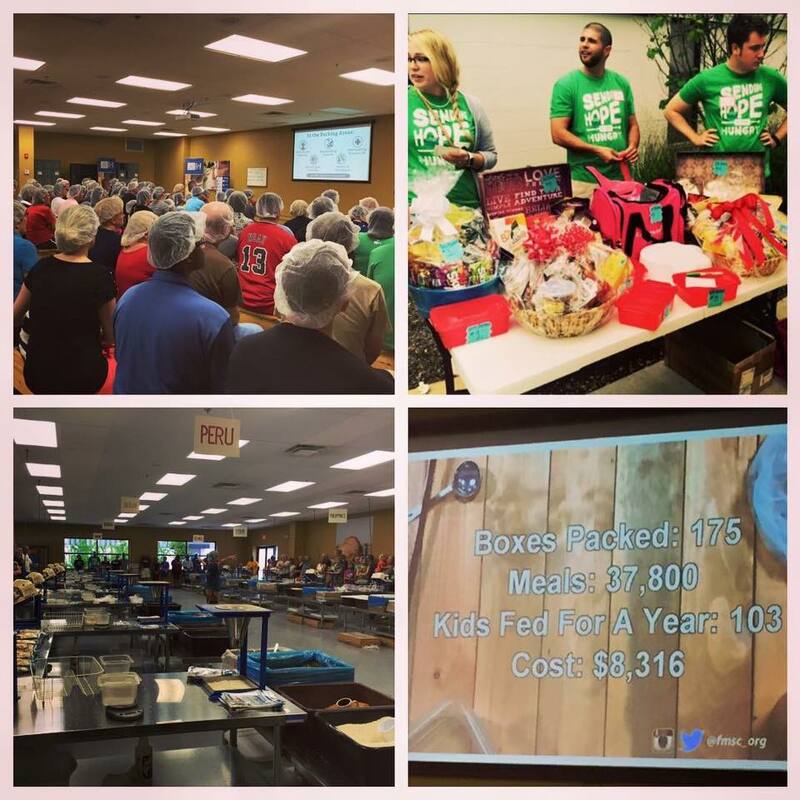 Their mission statement is to “Feed God’s Starving Children Hungry in Body and Spirit.” and their goal is to provide packed meals to needy children internationally. Since their founding, they have become a well-established organization. They have earned a four-star rating from Charity Navigator for the last ten years, and allocate 92% of their donations to the feeding process. 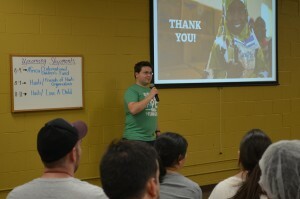 One of our team members, Mark, works for a company that has a close partnership with FMSC. He took the lead to contact FMSC and spoke with Lisa at FMSC’s development department to begin partnership efforts. We were able to utilize some of their resources to start our social media campaign and were able to utilize a FMSC website portal for collecting donations and for educating our friends and families about FMSC. Several group members were able to generate volunteer interest for a day other than August 8th. Given the numbers involved and the relative ease by which volunteerism could be accommodated, three micro-events were held on July 16th, July 27th, and July 30th. 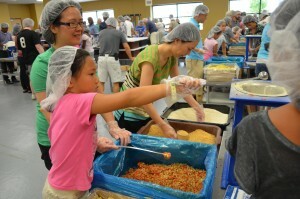 These micro-events netted 33 volunteers and 7,128 meals packed. Better still, these micro-events were used to generate further interest in the August 8th event day by serving as a concrete demonstration of the good that can be done by volunteering with FMSC. After weeks of working tirelessly to pursue our goals, the day of the event eclipsed even our wildest expectations. 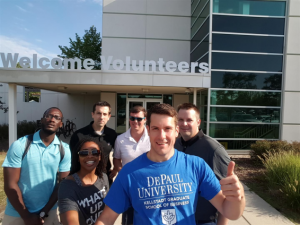 In addition to the micro-events leading up to the 8th, both teams together registered 157 volunteers for the service event, or an average of 12 volunteers per person. 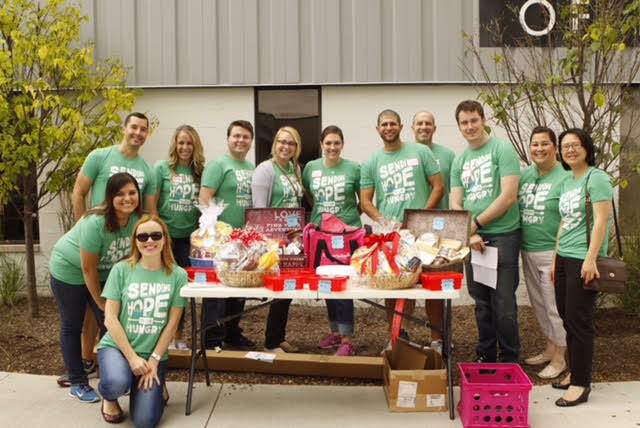 Our team specifically registered 104 people for the event, or an average of just under 15 volunteers per person. While it was impossible for us to get an exact attendance count for our group (a family not associated with our project reserved space for twenty), we had no fewer than 144 volunteers show for the service event. 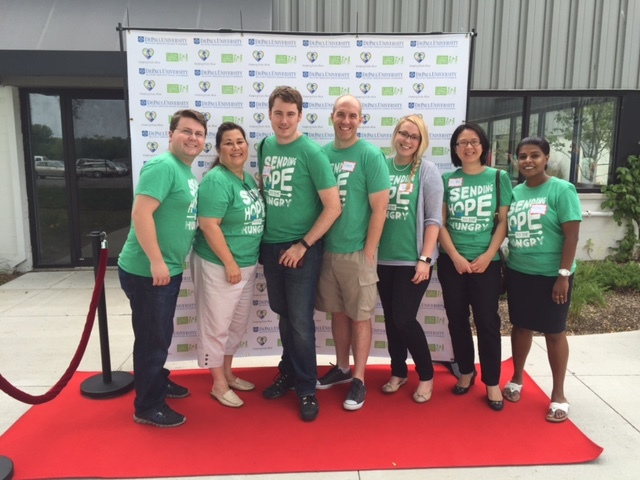 Volunteers arriving early to the service event were treated to our red carpet photo session (courtesy of Team 3, and full marks for a job very well done there). 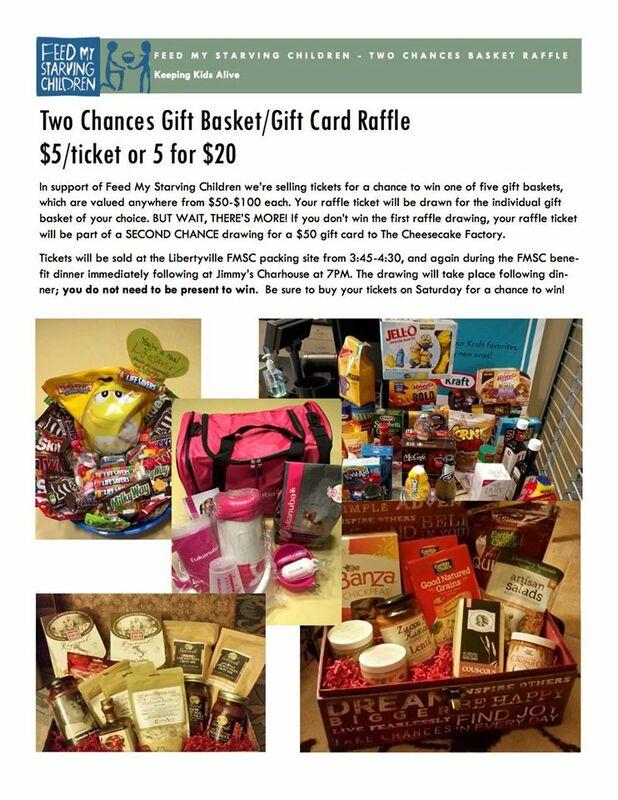 They also had an opportunity to purchase raffle tickets for our two-chance raffle, which was an incredibly popular draw. And, of course, each of us had the opportunity to network and verbally speak to what we were about to accomplish. Two exhausting hours later, our volunteers packed an amazing 33,188 meals, which is enough to feed 90 kids for a year. We were also able to collect survey feedback from 53 people, or 37% of total attendees. 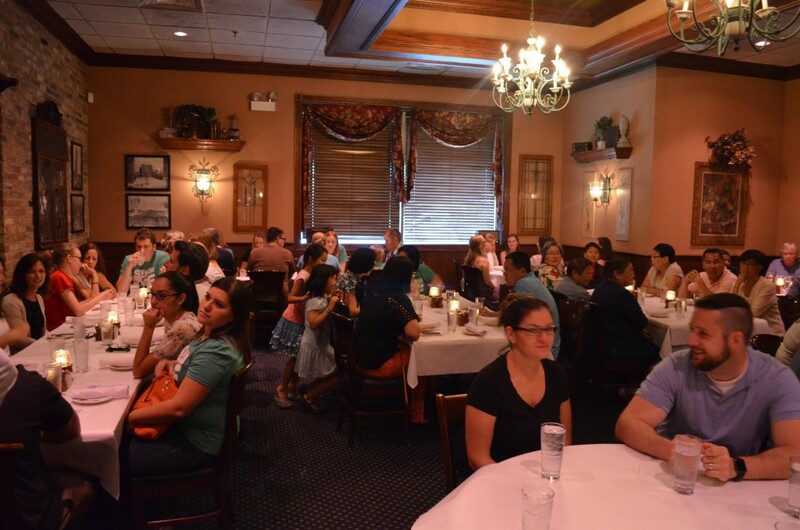 Following the event, we moved over to Jimmy’s Charhouse, where we expected to have about 64 guests attend. Instead of 64, we had a whopping 94 people show. The raffle was drawn following dinner, a thank-you cake was shared with the group, and Jimmy’s Charhouse cut a check of $250 to FMSC. Overall, we surpassed every project objective we set for ourselves which was a pleasant surprise. Our group’s collaboration with Team 3 helped diversity our resources to create a better day-of experience for all of our volunteers. 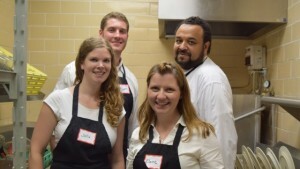 We raised $3,950 in donations and another $5,324 in volunteer time value as assessed by FMSC. Scope-Creep: First and foremost, our group learned the trial and tribulations of managing scope-creep. From the beginning we had difficulty agreeing on the scope for the project and once it was set we had difficulties staying with the set scope. Without an official project sponsor, it can be hard to work out differences in opinions within the group about the direction of the project. 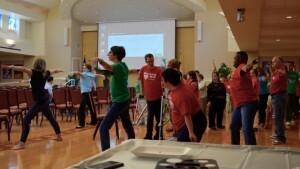 Opportunities presented themselves for unique fundraising events, and the group had to workout amongst ourselves what best fit into our project’s scope. Communication: Managing communication during the project amongst our 7 member group and then with the 6 additional member of Team 3 became a challenge. We used traditional methods like email, conference calls, and text messaging to communicate, but due to the volume of communications things got lost in the mix. Other teams used communication management applications that could have benefited our group. Communication amongst 13 people is never easy, but a service like Asana could have served as a hub to organized and distribute information. Risk Management: We found that our risk register addressed risk mitigation for what to do if too few of people RSVP/attend the events, but did not well enough account for too many RSVP/attend. The number of guests who attending the fundraising dinner surprised us all and left us scrambling a bit. Thankfully our venue was very accommodating and handled the issue quickly. In retrospect, we would like to have addressed this potential risk ahead of time. Determine what your project will consist of early and stick with it. The sooner you cement your plan, the sooner you can focus on fundraising and outreach. Uncertainty leads to limited time executing then plan. Appoint a project manager. Previous students gave this advice to us during the first class and it was invaluable. With large teams that are spread out around the Chicago-land area and all have numerous other commitments, a strong project manager is crucial to keeping the momentum going. Mark was our project manager and he did a fantastic job of motivating and organizing the group and we do not feel as though we would have been as successful without his great leadership. Utilized all of our friends, family, and coworkers to the best of your ability. We were continually surprised how much our networks were willing to give (both of their time and money) if you just simply ask. which then get shipped to the children that most need it around the globe. showcase their pictures on their social media sites and create additional awareness of our event. 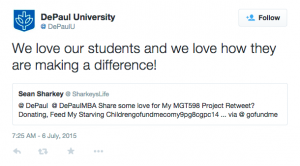 towards our fundraising goal since they were donating 15% of the proceeds to FMSC. 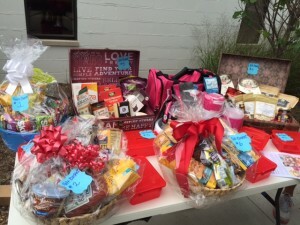 purchases, a raffle, and hosting a post-event with a percentage donated to our charity. participate) – Total of 60 packing event participants from our group. 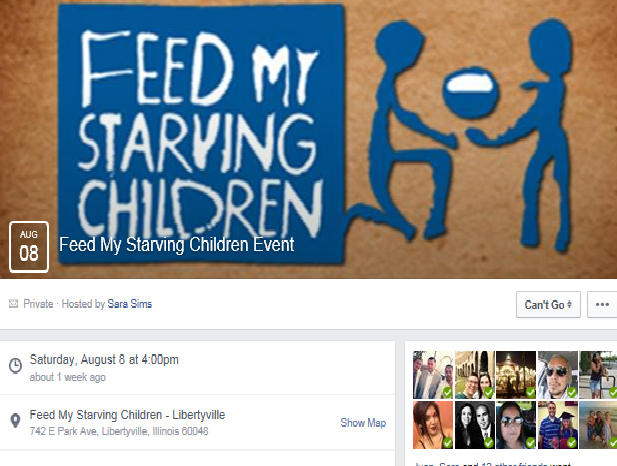 volunteers that did not attend have stated they plan to volunteer at FMSC when their schedule allows. red carpet and backdrop were donated to make the pre-event possible. 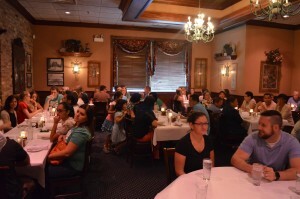 those that went to have a meal and in turn generated additional revenue for our charity. 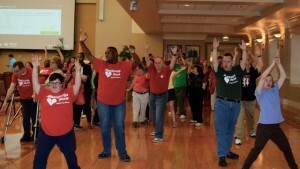 group had success in getting their companies to match or donate on their employee’s behalf. of your company right away and find other ways of gathering donations or volunteers. Otherwise, you will be scrambling at the end to get donations from family members and friends. project milestone needs to be completed. but our goals may have been more modest. 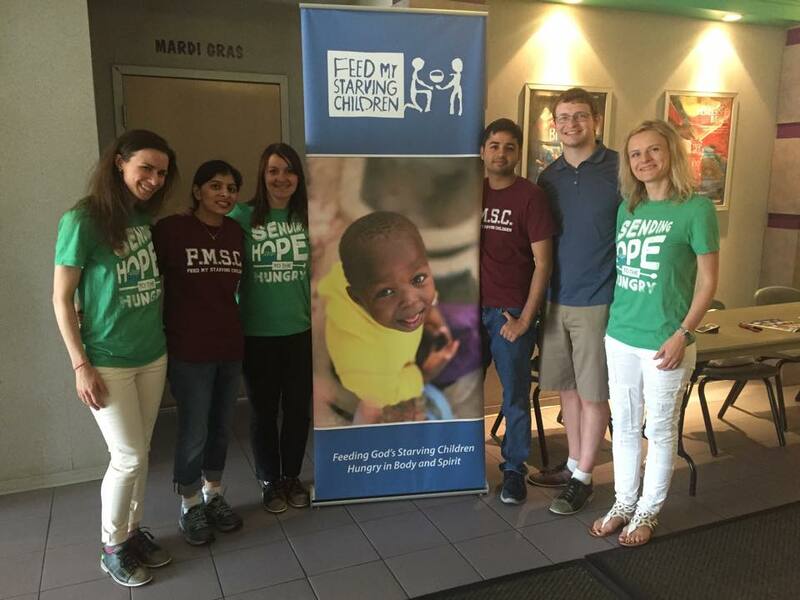 Our team chose to support Feed My Starving Children Charity. This charity’s main purpose is to deliver nutritious meals to starving children around the world. 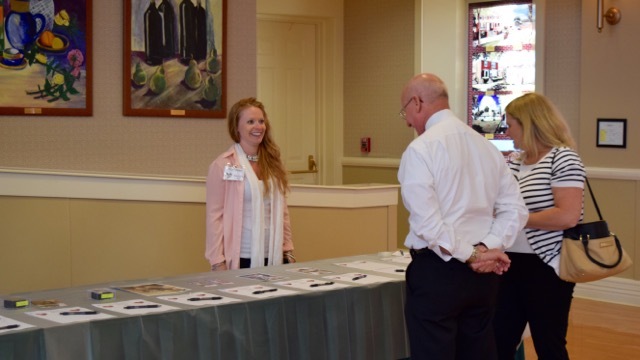 We hosted a series of micro events leading up to and culminating into one larger service. Micro took place throughout the month of July and the service event took place early August. 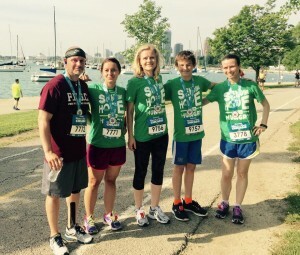 First micro event consisted of participating in the Rock ‘n’ Roll 5k race (July 18th). The goal of this event was to boost awareness of the charity, show our commitment to the cause, and potentially inspire donations. Second micro event was a bowling afternoon (July 26th) where profits where proceeds from the night were donated to the charity. This event also served as means to promote charity and event awareness. 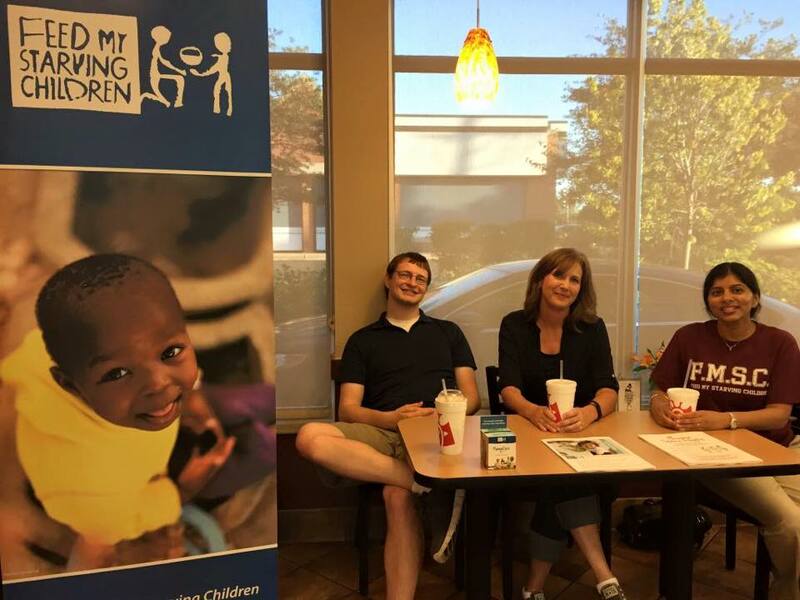 Third micro event consisted of a “Dine and Share” night (July 30th) at a local Chick-Fil-A near the location of the service event. A percentage, 15%, of revenues for a designated time period was donated to FMSC on our behalf. This also served as an opportunity to promote our service event and the charity. 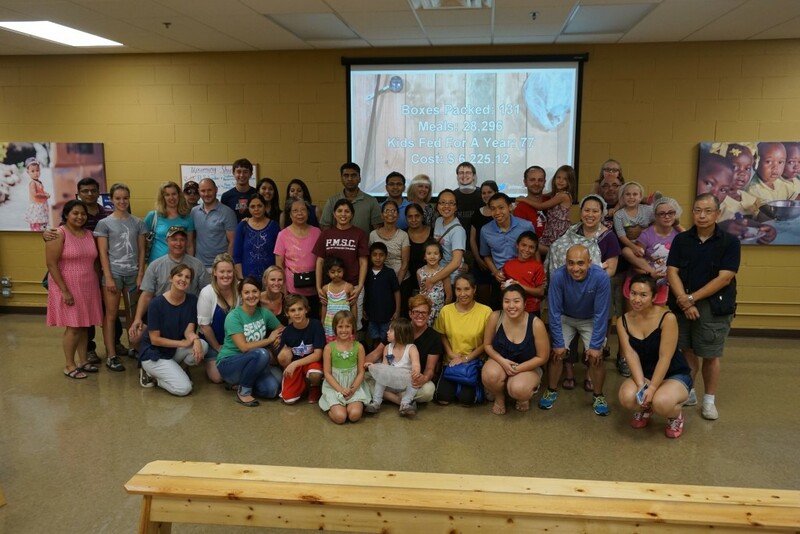 Our service event (August 1st) aimed to bring a group of people together to pack food into boxes at a local facility for Feed My Starving Children. To meet the awareness objective and drive donations we created a Facebook page as well as a Twitter page. We were able to promote our events, share updates, and receive comments from our followers. In addition we utilized free of charge online marketing services such as Metromix, Fun in the Burbs, Evently, and Timeout. We also distributed and displayed event flyers in Public libraries and other local businesses. We have learned from our successes as well as some of the difficulties we experienced throughout the project’s durations. Here are 3 we have all identified to be most important. Having a designated, responsible, and dependable Project Manager on the team from beginning to end is crucial. We have identified a member of the team to take the lead at the beginning and it helped tremendously. Using web based communication tools was very helpful and it encouraged every member to stay on task and current with responsibilities. It also created transparency, allowing each member to see the status of the project. Some tools used included Trello, Slack, and Google Drive. Not having all of the event attendees’ names created confusion. Using Eventbrite to track the number of reservations was very convenient. However, one person was able to reserve more than one spot with one name. The scope of our project was to partner with the Greater Chicago Food Depository (GCFD) and provide donations and service to help further their cause. Established in 1979, the GCFD focuses its endeavors on serving the residents of Cook County. 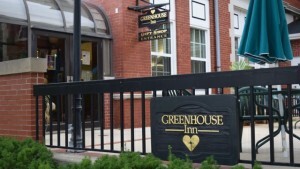 The GCFD is a nonprofit entity that disburses food and makes a concentrated effort to help individuals in its community become self-sufficient. 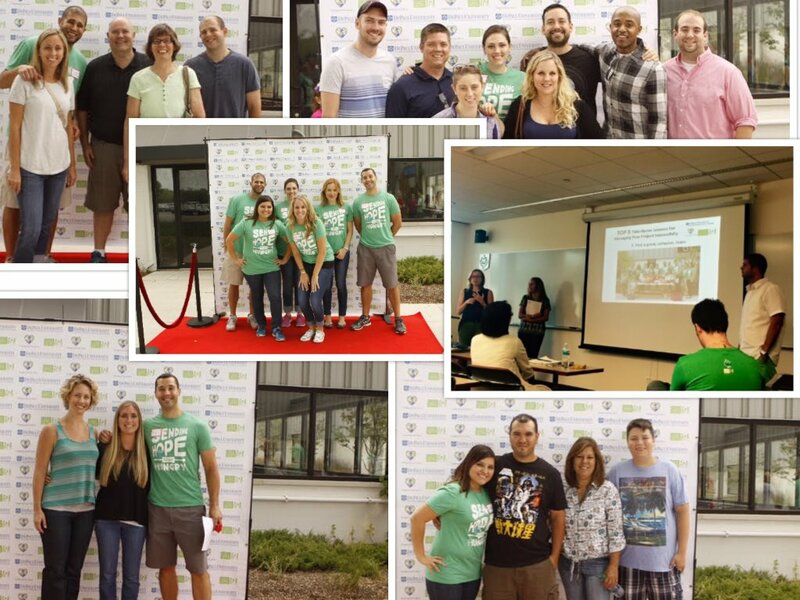 With our project taking place in the summer, our group was able to provide our services during a time of great need due to summer vacation and school aged children not receiving free or reduced price lunches at schools. The food drives were the main events of the project. Each member facilitated their own food drive with one or more organization and also included networks of friends and family. The physical food drives were managed by each group member by maintaining collection containers at their workplaces, social gatherings, or related institutions. Each food drive location was managed from corporate approvals, to solicitation, to delivery to the GCFD receiving center. 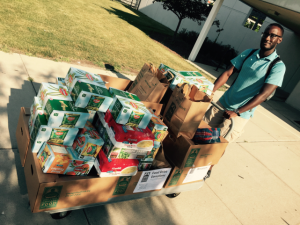 Advertisement for the food drive was completed through email blasts, social media, fliers, and other avenues. Working with the GCFD we had access to a virtual food drive platform hosted on their website. We were able to develop our own webpage complete with the DePaul logo and member’s desired donation group to adequately track our respective contributions. 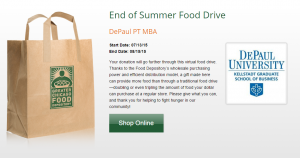 Our friends and colleagues were able to enjoy a virtual shopping experience by placing virtual food items in their virtual cart and checking which deposited their monetary donations directly to our account. This created a more appealing experience than a traditional donation process. 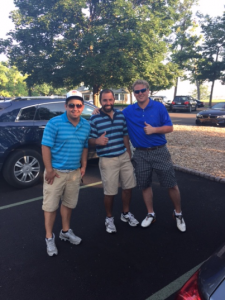 Through the project planning it was recognized that we had a strong network of golf fans. Leveraging this, we created a golf event complete with donations and giveaways that we were able to secure through our corporate avenues. 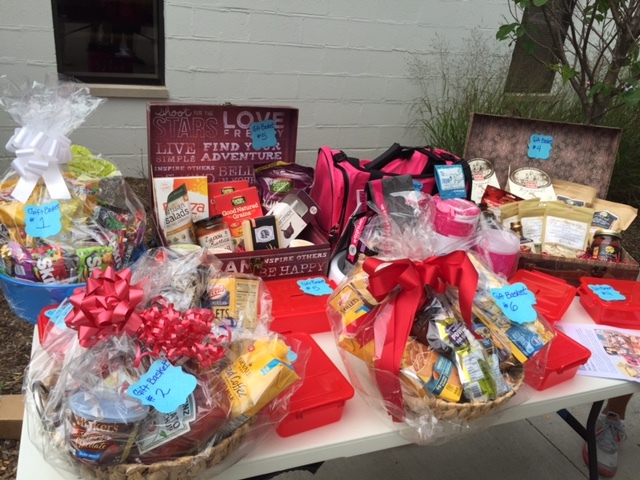 This event allowed our supporters to enjoy the weather while supporting our cause. Each of our group members spent a day off work to participate at the GCFD warehouse volunteering their time. We spent the day working with other engaged volunteers processing incoming donations. This allowed the entire project experience to come full circle. While collecting monetary funds was critical to our project, we decided to take the opportunity to inspire other people to join the fight against hunger. Therefore, two of our success matrices are non-monetary in nature. Our three success metrics were all met and exceeded through the course of the project. We were able to more than double this goal by raising over $5175.89 in donations both monetary and physical food. We completed this by raising $4,176.69 in monetary funds and $999.2 worth of physical food donations by the conversion rate of $1 = 1.25 lbs. of food. To top this off, we can see by the conversion of $1 = 3 meals, we were able to supply 15,528 meals into the hands of those that would have otherwise gone hungry. Through the project, we were able to interact with many people during the food drives at various communities. Many people expressed their support to the cause through donations and kind words and expressed interest in future involvement. Through our project we believe that we have truly brought awareness to the GCFD cause through this project. This may be the most important aspect of our success! Each of our team members successfully took a day of absence from their respective workplaces and families to participate in a volunteer day at the GCFD. During this day we were able to assist in the sorting and repackaging of over 30,750 pounds of potatoes! Choosing a partnering organization that will support you is critical. By partnering with the GCFD, we were able to take advantage of an online virtual donation platform, boxes and bins for donations, and a helpful contact. He was able to answer our questions and guide us through a successful project. Get started early. It goes without saying that you will not have much time to complete your project. The earlier that you can get the wheels turning the more impact you will have. You will be working through corporate red tape, production schedule, and other items which all take time. Communication was incredibly important due to such a large amount of information to flow through multiple stakeholders. Our team made it a point to over- communicate in an attempt to ensure the proper flow of information and ideas. This proved helpful on many occasions. One issue that we experienced was not choosing the most suitable platform to complete this in however. Most of our communication was via email which quickly became cumbersome to extract information from. Utilizing alternate project management tools to collect and store information would have been beneficial. Identifying tasks of our project in the project inception and assigning responsibilities to team members helped to streamline the project. By spreading out the workload it allowed each member to focus on specific tasks and be responsible for completion. Additionally, members assigned to tasks that they enjoy or have specific strengths in enhanced the quality of deliverables. My secret to success in creating blog posts is to spend a couple of hours Googling variations of “project management [topic concept],” getting frustrated at the lack of quality articles, giving up for about a day, and browsing reputable news sites for something unrelated. A snazzy-looking article crops up, you read it, and you think, “Hey, this actually is a lot like what we’re learning about in class!” Fire up the ol’ word processor, channel your muse, and hey-presto, you’ve got yourself a topic! This off-the-wall article I found in my search earlier this month is an unassuming little piece from BBC.com titled “Find it, fix it: solve it like a boss.” The content of the article is about what you’d expect, given the title. You learn about the struggles of a Microsoft executive in bridging a communications gap in his division, and how he concocted a process to right the ship. Some of the things the article shares with the reader include identifying a problem, seeking the optimal solution, planning for multiple outcomes, being ready for failure, making a tough decision, and using processes to find solutions. I’m always fascinated by the things being positioned in media and journals as world-beating concepts. So much of what they come up with seem to be fairly fundamental concepts by MBA standards. I found this article to be no exception, but I thought it was really interesting to realize how interchangeable project management skills are with leadership skills. It was a bit of an Aha moment for me, and I think it might be one for you, too. Over the past couple of weeks, I’ve been paying especially close attention to the lessons taught by our illustrious professor. I mean, don’t get me wrong. The how’s and why’s of creating a project team, defining scope properly, and everything else we’ve learned is so crucial to having a strong project. But me, I like to think about what happens when things go wrong. The timing of this article and recent class content has been very interesting, given something I’m digging into at work. For those of you who didn’t get a chance to read my original best-seller (M&A and Project Management, check it out at a computer or phone near you today! ), one of the things that I’ve come to realize is that my company uses a matrix approach to project management. That’s driven in part by limited resources, in part by the pace of cultural development, and in part by high concentrations of SMEs. As such, the processes used in projects tend to vary, as do the results. One project that was implemented this year was the adoption of a consolidation of all frozen purchases in the state of California into a hub-and-spoke model, which would service the rest of our continental US warehouse network. You see, shipping frozen products is an expensive and relatively risky endeavor, and when factoring in both the miles and the relatively small PO sizes, a shift to a hub-and-spoke model seems to be quite the layup. Unfortunately, the project team was managed in cells and was heavily favored by our supply chain department. This resulted in a project moving all the way to implementation without feedback from critical groups, Pricing being one. The consensus was that general analysis showed the model to be favorable, and we were committing to not impacting our customers’ pricing during the implementation. Because due diligence didn’t take place, the pricing for both the initial inbound POs in California and the transfers to the spoke DCs in the East were never adjusted, driving a six-to-seven-figure variance impact to certain P/L lines. What’s worse, the fact that pricing wasn’t adjusted means that there is the potential to unknowingly pass through some of the variance on the project, which would leave the company with a six-figure hole short-term and some very uncomfortable conversations with our customers long-term. Had the team taken their time and exploring the possible outcomes, this entire thing could have been managed within the scope of the project and been addressed accordingly. As it is, there is now a fairly real financial exposure, the need to correct the issues in the midst of heavy on-boarding and integration activity, and a fundamental question of whether or not the model will generate the same level of savings as it initially touted. There is no fallback plan in place, and for the moment a fairly uncomfortable shadow hangs over what was supposed to be a prominent accomplishment for the company. I stumbled upon this while doing entirely unrelated work last month, and I was able to frame it out in about an hour. If it was that easy for me, it should have been even easier for them to spot. But that’s the kind of stuff you miss when you’re looking to force a project through come hell or high water. Just like the article states, you need to take the time to consider all outcomes and plan for failure. You’ve got to slow it down, then all will be groovy. If decreasing project duration was easy we would all be doing it! Anyone can spend less time on a project, but the challenge is how to reduce project time while keeping quality consistent. Spending less time on a project means you have more time for additional projects and more time for additional clients which should mean more money in your pocket. I found Miranda Morley’s article, “How to Reduce Project Duration”, to be beneficial by providing five steps on how to reduce project duration effectively. Step One: Morley discusses how to keep track of how time is used and eliminate time wasters. In beginning phases of the project or even before the project starts be conscious of the time taken for snacks, coffee breaks, socializing, etc. By keeping track of this time you can estimate how much time your next project will be increased by. You can also keep track of this wasted time in the first half of the project and focus on decreasing this wasted time in the second half. Realistically, this may be hard for groups that are crunch for time, but always something to be aware of. Step Two: Make weekly or daily tasks. This may seem simple, but I feel like a lot of project groups forget to do this. Tasks and action items may be set in the beginning of the project, but staying on a weekly or even daily schedule ensures that the group stays on task. Having a daily list also helps the group feel accomplished when they can cross off action items. This can help everyone to stay motivated, especially over long projects. Step Three: Morley talks about understanding how you work best. First, how do you work as an individual? Are there certain times in the day that you are more alert? Do you work better in certain locations? Once an individual figures out their own work style they are able to better fit into a productive group. Step Four: Collaborate and delegate. This step is pretty obvious, but it’s beneficial to split up group tasks by strength. Not only is it important to the know the strengths of your group members going into a project, but it’s important to give them jobs that focus on those strengths. This helps to cut project time down drastically when you don’t have to worry about individuals spending days on their portion of the project all because they didn’t understand something. Also, discuss strengths and weaknesses in the office or in your project teams so that you know who to contact about helping you with your project. Step Five: Cut out distractions like social networking, texting, unnecessary email, etc. This is HUGE! We’ve all been seated at a conference table with group members that can’t seem to take their eyes off their cell phone or people that are clearly looking at pictures on a social media site. This becomes a huge distraction and causes group members to be distracted. While these technologies are fun to use and may even help you communicate important business information, you don’t have to use them during time that has been allotted for working on a project. This article was interesting to me because I feel that many people are so caught up in spreadsheets and data showing how to reduce time, but often we forget the little things that can really help to decrease the amount of time spent on a project. Remembering these simple steps can dramatically help to reduce project lead times while keeping quality consistent. What other steps could be added to this list? What has worked for you in the past while working on an important project? What would you do if you were given a super power…? No… not flying or saving the world…but rather…. the ability to say “yes” or “no” to the projects your company is working on…. And with each of your “yes’s”, there would be a resource allocation (money and people). Because of your super power, or “super yes”, your company would be developing new products and 200 of the product developers (that you manage) would be working on the projects of your choice. Wouldn’t that be cool? But then imagine that your company actually needs 500 product developers, and your budget is a quarter of what you really need. Imagine all of the angry BU Presidents sending you nasty messages (after you denied their projects and told them you don’t have any free resources to support their ideas). And then finally, imagine that at the end of the year, you (and your team) are rated based on the projects you selected, productivity you delivered or the innovation that came out of your shop. And imagine that your and your team bonus depends on it! Would you still like that? How would you select the projects that your team would work on? Which projects would you reject? How would you manage angry BUs who are unable to deliver their targets because of your decision? How would you make this process “emotion-free” and objective, so you wouldn’t be the most hated man/woman in the company? Last week, I was invited to a meeting with the head of R&D who asked me to come up with the matrix for the Stage Gate process and (human) resource allocation. In other words … I was asked to create a template that would help my company to decide if the project should obtain our “super yes” status. Aligned—Agree with the specific organization’s vision, strategy, and objectives. Optimized—The KPIs should be focused on providing organization-wide strategic value rather than on non-critical local business outcomes. Selection of the wrong KPI can result in counterproductive behavior and sub-optimized results. Realistic—Must be cost effective and fit into the organization’s culture and constraints and achievable within the given timeframe. Attainable—Requires targets to be set that are observable, achievable, reasonable, and credible under expected conditions as well as independently validated. Clear—Clear and focused to avoid misinterpretation or ambiguity. Understood—Individuals and groups know how their behaviors and activities contribute to achieving the KPI. Predictive—The KPI may be compared to historical data over a reasonably long time so that trends can be identified. Agreed—All stakeholders should agree and share responsibility for achieving the KPI target. Reported—Regular reports are made available to all stakeholders and contributors so they know the current status and are able to take corrective action if needed. In order to assign the resources to a proposed project, our team decided to use NPV/Man days. So… we will not picking/selecting projects with a high NVP but lengthy in time and with a high headcount requirement. We can’t afford to tie our resources for months in those projects. Instead, we will be picking and approving projects that have high NPV, that will be easy (and quick) to implement, that will not tie our resources for months, and that will bring the highest return per resource. Do you think I made the right recommendation? I found the article below interesting as it discusses the idea that in new projects, specifically those that may be in unfamiliar or unpredictable environments, it may be better to simply act instead of analyzing. This concept makes me think about our class assignment to build a structure with uncooked spaghetti noodles and marshmallows and how our team reacted (and failed miserably) to that project. We took the first 25% of the project time to map out our strategy, sketch out our detailed design plans, review our budget forecast for materials, and create a rough work breakdown structure. We assigned tasks to team members such as collecting specific supplies, breaking noodles into correct sizes for our base and support beams, configuring the correct marshmallows (small or large) in the right sections, and monitoring the time we had left to complete the project. So what went wrong? Within the first minute of the ‘build’ stage of our project it was clearly evident our design was not going to be successful. Even though we had mapped and planned out the entire project in detail, and we had two professional engineers working on the project, none of us had any experience building a structure with uncooked noodles and marshmallows. What made us believe our unproven ‘plan’ would be even remotely successful to follow? The article goes on to discuss the concept of “learning through action” and the steps a project manager can take to move forward, making right and wrong turns, to learn more about the eventual correct direction for the project. The project manager is not ‘flying blind’ in the project, but instead moving carefully into action by simply starting and evaluating the results. Act: Take a smart step toward a goal. Learn: Evaluate the evidence you have created. Build: Repeat Act and Learn steps until you accomplish your goal, opt to change direction based on findings, or discover the goal cannot be competed. The paper examines how the old methods of planning, forecasting, analyzing, and allocating for new and uncharted projects simply do not result in success. Instead, the authors discuss some points to consider in using the act-learn-build concept above. The act-learn-build model is inherently low risk, but not risk free. Within each phase consider how much you can lose in terms of time and money and still continue moving forward. Instead of asking “How do I get everyone committed to my idea?” ask, “What’s the least amount of commitment I need to act?” The idea is to have just enough freedom to continue to explore the concepts. Make it clear to management this is a proof of concept rather than full scale project plan. Have you ever experienced something similar with being on or managing a ‘new’ project at your company? Do you have examples where the Act-Learn-Build method may have been a better approach to a project?